Champions before the end of February! Its been a busy few weeks for most hockey sides as they try and fit in rearranged games in the slip week or on a Sunday in order to complete their league fixtures before the end of the season schedule for mid-March. The Ladies 2s have had to be more creative and agreed to play away at Selby on a Tuesday evening when Selby normally train at their pitch. The first attempt a few weeks ago was scuppered by the frost but last Tuesday saw the game finally proceed despite it being near Baltic conditions. A wise move in view of the Beast from the East looking likely to scupper any prospect of hockey for the next 2 weekends…. Your average football team complains if they have to play 2 games in a week and need a huge squad of about 30 players with a set of backroom staff in support to cope with a supposed busy schedule. 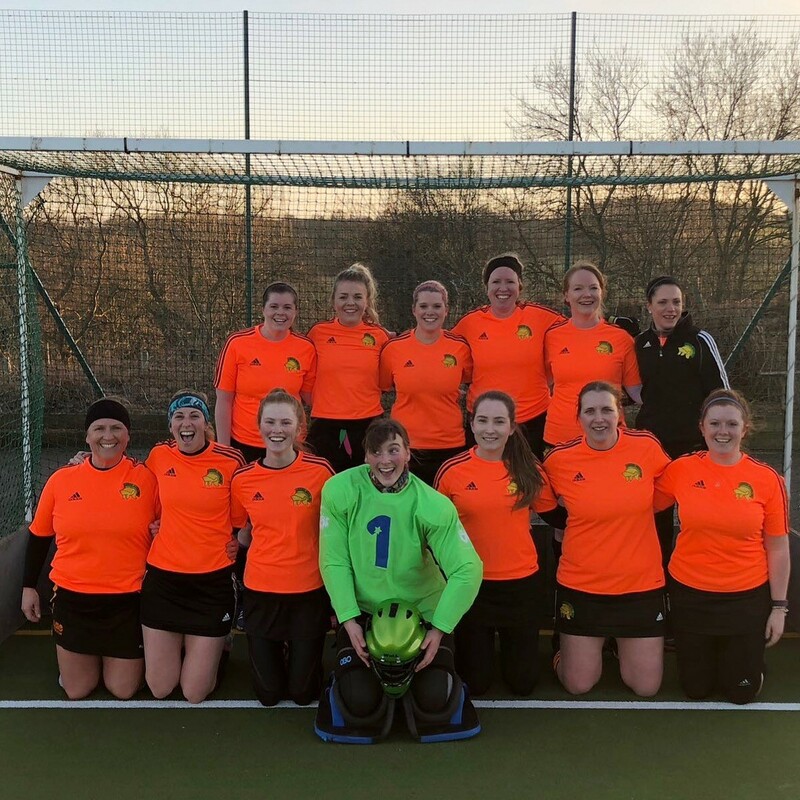 The ladies 2s with a core squad of about 15 players just rolled up their sleeves and got on with things, playing 3 away games in the space of 5 days as they ventured around the county in their quest for the top spot in the Yorkshire Premier League. Away trips to Selby (Tuesday night), Bridlington (Saturday afternoon) and Slazengers (Sunday afternoon) would go a long way to deciding the outcome of the league, especially with Slazengers also on a good winning streak and one of only 2 teams who could realistically overhaul Leeds Adel at the top of the table, albeit with games running out. The 2s have come close over the last 2 seasons, finishing in runners up spot both times, then being messed around with a possible play off 2 years ago and then losing a close play off game against Lindum last season to deny them promotion to the North East league. This season the team has gone through something of a transitional phase with initial co-skipper Jess Richardson joining Rosie Baker and Abbie Taylor in the 1s for the season and then the remaining co-skipper Sandra Clarke and Hannah Jones stepping up to the 1s in November to leave the 2s with a new look squad under the leadership of their 3rd skipper of the season, Sophie Powley. With a pleasant mix of youth from the Pam Hardaker junior academy production line, plus some new faces (including several who have stepped up from the 3s this season) joining the core of last years team, the 2s have created a strong team spirit and gone from strength to strength leading into the busy three game week. Prior to the triple-header, the 2s had suffered only 2 defeats this season (narrowly losing away at Ben Rhydding and Brigg) but 14 wins including a 100% record at fortress Adel had given the team a healthy lead at the top of the table, although this could still be turned over in the remainder of the season. Last Tuesday was a typical battling performance in unusual circumstances, first playing on a cold Tuesday evening against a side familiar with the pitch at that time, second playing in the away black shirts and third against a competitive Selby side who were sitting in 4th place and still capable of having a say in the destination of the title as they had games against Rhydding and Slazengers still to come. Keeping the first clean sheet since Christmas was no mean feat as Selby had several chances to score, but some fine keeping from young Stella Jaquiss in goal kept the Selby forwards at bay. At the other end, Katie Wood dragged herself off her sick-bed (and the subs bench) and scored the opening goal, followed shortly after by a Laura Panteli short corner strike to ease the nerves. The second half saw a further scrambled goal from Annabel Walker and despite Selby continuing to press hard for a goal, the defence were resolute and with the support of the midfield who ran tirelessly all night. The first leg of the 3 game week was safely dealt with and Gabbys father in law who had braved the conditions was able to be given the lucky mascot tag for the team as he watched his first ever game of hockey. The second leg saw the long drive to the east coast for a game against Bridlington, whose place in the relegation zone wasn’t to be treated with any complacency. Some teams can be very different depending on whether they were playing at home or away, especially when it comes to a long journey. Woody once again brought along her scoring touch bagging 4 goals and Laura Panteli scored a hat trick too, with Tina Parson adding a further goal as the 2s ran away to win 8-1. This meant the game the next day against Slazengers had an added incentive, safe in the knowledge that a win would secure the title as Slazengers would no longer be able to overhaul the Leeds Adel points tally if they lost. Another cold day, against a side who had won 6-2 the day before and Slazengers had home advantage with a bigger crowd to cheer them on (although Jess, Jim and Sam were perhaps keen not be outdone on the sidelines!). The 2s have gone 1-0 down in a few games since Christmas but its testimony to their character and spirit that on each occasion they have come back strongly and scored shortly after and three goals from Woody, Robyn Lindsay and Sophie Lancaster meant the half time team talk would be all the better, despite skipper Sophie nursing a smashed thumb shortly before the interval. The second half saw the 2s complete a professional display keeping Slazengers out and closing out the game with some quality hockey and repelling anything Slazengers tried to throw at them. The final whistle confirmed the team as champions with 3 games to spare and the next challenge for the 2s will be to try and not lose any of the final 3 games v Brigg, Leeds Uni and Harrogate whilst hoping to score the 18 goals needed to reach 100 for the season (snow permitting). I have seen the 2s play many times over the last few years with a variety of players coming and going either on their way up to the first team or before they head off to University. This season has seen further challenges with the skippers stepping up to the 1s and the need to bring through players from the 3s and quickly integrate them into the team. Having the experience of Tina (with her selfless running, constant encouragement and vital goals when needed), Rachel (cool, calm and collected on the ball with solid distribution even when under pressure) and Jenny (coming out of retirement but still solid as a rock at the back with a lethal short corner strike when venturing forward) has been key in helping new players to settle in, whilst the core of the team from the last few years with Sophie Powley (reverting to the backline after a few years up front for the team), Laura Panteli (one of the hardest players to shake off the ball in the whole league with the added bonus of being a regular goalscorer) and Robyn Lindsay (industrious, strong on the ball and an all round team player) has given them a platform to work from and allow the new players to flourish. Gabby Nusenbaum, Rosh McEwan, Harriet Thomlinson, Annabel Walker and Jane Holmes have all stepped up from the 3s and not looked out of place from the start. Their energy and determination in the midfield and forward line as well as their keen eye for goals, has helped the 2s dominate most games they have played. Their rise shows the strength in depth at the club, as well as the benefit of an organised weekly training session under the watchful eyes of Katy Blyth, Paul Lewis and their willing assistants. The juniors have also progressed tremendously with Stella Jaquiss in goal continuing to show why she is one of the best junior keepers in the county, Sophie Lancaster showing flashes of genius, especially when on her reverse stick (assuming she remembers to bring it), Anna Shields playing like a seasoned veteran (sadly the 2s will be without a Shields family member for the first time in a long time next season with Anna heading off to join sister Megan at University) and find of the year, Lily Reynolds, making goal line clearances one minute followed by marauding runs up the right wing the next. And then there’s Woody…..some of her skills on the ball have left many an opposition defender in bewilderment as she seeks out yet another goal, usually on her reverse side. A number of other players from the 3s have willingly stepped up when needed so their contribution should not be overlooked – Becky Louth, Steph Bradbeer, Frankie Tarren, Millie Eggleston, Becky Hill, Sarina, Charlie Hall and Sarah Dunn who donned the goalie kickers pads one weekend in an emergency! Fingers are now crossed in the hope that the deserved promotion can be achieved, subject to the 1s staying up. The 1s vital win last Saturday may help in this regard but they still have some vital games remaining with further success helping both them and the 2s end of season outcomes. Either way, I am assured there will be a huge celebration after the 2s (supposed) final home game on 17th March (and then again on 24th March if we have to rearrange snow-postponed games), with the added bonus for the 2s being they will finish their games at 12 o’clock! I also expect the 2s will be out in force at the end of season club dinner on 11th May, especially as one of them will be celebrating not just a league win, but also a birthday…..could be an expensive evening for some people….